East Lindsey District Council has ruled out job cuts - but admits it could move into new headquarters as part of plans to raise revenue and off-set crippling cuts in Government funding. The council has drawn up a list of potential projects which - if adopted - could provide long-term financial stability. ELDC has seen the amount of Government funding it receives slashed by £7m since 2010 - 30 per cent of the revenue it receives from Westminster. There could be another £3.9m reduction over the next three years as Government grants are phased out and replaced by income based on business rates. However, East Lindsey admits the final reduction could be more than £4m with exactly how the rates system will work still to be finalised. However, he stressed that despite the cut in income, ELDC was determined to continue to provide quality statutory services, look after vulnerable people, and promote economic growth. He admitted further cuts were ‘not possible without having an impact on frontline services and vulnerable residents’. •Work with Magna Vitae to improve leisure services - including the redevelopment of the Station Sports Centre in Mablethorpe. •Improving renewable energy, including providing electric car charging points in council-owned car parks. Coun Fry stressed a site for a new HQ had not yet been identified, but ruled out sharing with other authorities. He confirmed ELDC had borrowed £20m to invest in as yet unspecified projects. However, he ruled out following the example of neighbouring WLDC who had invested in ‘individual buildings’ - like hotels. Instead, Coun Fry said ELDC favoured investing in ‘property bonds’ which would produce an annual return of around 8 per cent - enough to cover loan re-payments and leave a profit for the council. 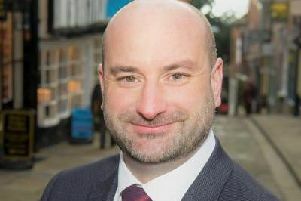 Coun Fry admitted some decisions might be unpopular, like the charge for green bin collections, while it was revealed £300,000 had been set aside for a feasibility study into the ideas. Coun Leyland said it was ‘an exciting time’ for ELDC.